When a "rearwards-facing" child seat is installed on the front passenger seat, it is essential that the passenger airbag is deactivated. 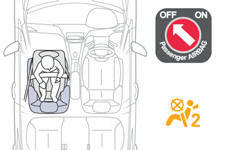 Otherwise, the child would risk being seriously injured or killed if the airbag were to inflate. 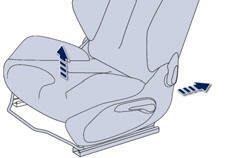 When a "forwards-facing" child seat is installed on the front passenger seat, adjust the vehicle's seat to the fully back and highest position with the seat back upright and leave the passenger's airbag activated. 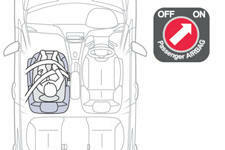 Ensure that the seat belt is correctly tensioned. Passenger seat in the fully back and highest position.